The 7 of 10 concept was introduced on this newsletter on March 7, 2010 in Issue 175 and on March 28, 2010 in Issue 178. The Zetas have predicted that one or more of these scenarios will occur before the end of 2010, but until this past week have not stated which event could be anticipated to come first. They have not sequenced them. Previously, the had described the folding of the Mariana Trench against the Philippine Plate, which likewise will tilt and fold against Indonesia. This area of the Ring of Fire will be folding like a deck of playing cards being swept up and gathered up off a table top. ZetaTalk Prediction 8/21/2010: It is the pressure from the Pacific that is the issue, as the Pacific is compressing. Likewise, the Philippine Plate is at issue, as it loses in the compression game and in essence is pushed under and lost. The Philippine Plate is tipping, rising at the Mariana Islands and diving under the tongue of the Eurasian Plate that holds Indonesia. This tongue is itself being pushed down. Imagine the domino effect of the Mariana Trench folding against the Philippine Plate, tipping this sideways to drive the western edge under the tongue holding Indonesia, which is at the same time breaking and bending to subduct under the curve of the Indo-Australian Plate. ZetaTalk Prediction 10/16/2010: The 7 of 10 scenarios describe plate movements, and for this to occur something has to release the deadlock, the current stalemate where the plates are locked against each other. Once the deadlock is broken and the plates start moving, sliding past each other, new points where the plates are locked against each other develop, but these are weaker locks than the one at present. The current lock, as we have so often stated, is the Indo-Australian Plate which is being driven under the Himalayans. This is no small lock, as the height of the Himalayans attests. Nevertheless, the activity in this region shows this likely to be the first of the 7 of 10 scenarios to manifest. Bangladesh is sinking and the Coral Sea is rising, showing the overall tipping of the Indo-Australian Plate. Now Pakistan is sinking and not draining its floods as it should, while Jakarta on the tongue of Indonesia is also sinking rapidly, showing that the tilt that will allow Indonesia to sink has already started. In addition to the 7 of 10 sequence, the Zetas provided more information on the overall effect of the S American roll on the S American continent. Previously, the Zetas had described the effect on the Caribbean. ZetaTalk Prediction 3/27/2010: For those wondering what islands will be at risk during any S America plate roll, we suggest the following exercise. 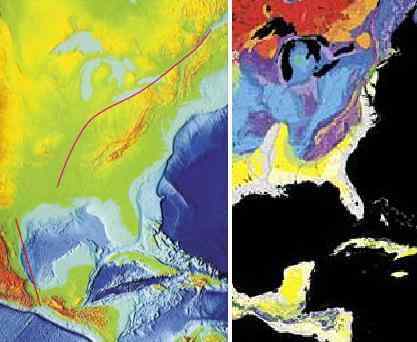 Establish the fault lines, the borders of the two plates in question - S America Plate and Caribbean Plate. Pin the S America Plate at the tip, but spread the Atlantic apart so the top part of S America must roll to the west. Clearly, this puts S America pushing over the Nazca Plate to her west, which is occurring now and causing quakes all up and down the Andes. For the Caribbean Plate, which includes Pamana and Central American countries, there is pressure where the Caribbean Plate loses when encountering the larger and more solid S American Plate. The damage to the Caribbean Plate is not just to those areas which will be pushed under the gliding edge of the S American Plate, but also to those areas which will be dragged along, and ground up as the plate border is rubbed like sandpaper, an abrasion. In addition, the Caribbean Plate will react to pressure on one side by raising an edge on the opposite side. And any associated fault line will likewise react. This is a complicated matter, but suffice it to say that there will be no islands in the Caribbean which will not be affected, nor will the countries in Central America find themselves exempt. The Zetas likewise described any tsunami in the Caribbean that would accompany the S American roll. ZetaTalk Prediction 7/10/2010: Tsunami are generated anytime a plate drops or rises under the sea. When the S American Plate rolls, it will push the Caribbean Plate down, creating a void. The void will primarily be at the southern part of the Caribbean Plate, where islands will suddenly lose elevation, some sinking entirely. This void will pull water from the Caribbean as well as the Atlantic, which would seem to negate the likelihood of a tsunami, but there will be a clash. When the water rushes into the void it is water on the move, with momentum, and this is the tsunami expected along the coastline of Venezuela and its neighbors. This coastline will at first find water receding, but this is a false signal and should not be trusted. The wave will be coming. The islands will have no such warning, but will sink suddenly in concert with the quakes. In that the S American Plate reaches to the center of the Atlantic, the rolling of the S American Plate will seem to have scant impact on those coastlines facing the Atlantic. There will be irregular tides, and certainly earthquakes, but beyond a slight spreading of the Rio Parana river mouth at Buenos Aires, which is ripping apart where the river empties into the Atlantic, there will be little impact. Are there signs that S America is preparing to roll? There are many signs, but these are what the Zetas describe as precursors, very minor in comparison to the actual event, which will occur suddenly and carry with it an immense impact. ZetaTalk Prediction 10/16/2010: Though there have been a lot of precursor signs that S American is getting ready to roll- an 8.8 quake along the Andes in Chile and exploding oil and gas rigs in Bonaire and Trinidad-Tobago - these signs are but the lightest touch compared to the actual event. 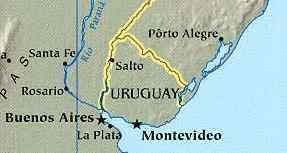 We have described tsunami that will occur in the Caribbean, and a ripping open of the Rio Parana river mouth at Buenos Aires. The primary effect of the S American roll will be on the small islands in the Caribbean which ride just north of the S America Plate border, as these will lose elevation suddenly, and in some cases sink entirely. Will there be earthquakes? Such movement of a plate does not occur silently. The entire region, from the tip of S America to the islands on the north border of the Carribean Plate will be jolted, and repeatedly, during the roll. Along the Andes, these quakes will be in the range of a magnitude 8-9, but lesser elsewhere. In that the Andes will rise, riding over the Nazca Plate to the west, no significant tsunami will be produced along the west coast of S America. All major cities in the mountain building areas will experience these great quakes - Santiago, La Paz, Lima, Qinto, and Bogota. Those living along the border of S America and the hapless Caribbean Plate will experience a great moaning and grinding while the S American Plate glides over the Caribbean Plate, pushing it down with its weight as it does so. Such a gliding action does have catch points where the plates are not smooth, and hesitation and jerking with a sudden release occurs, a type of earthquake that seems to last for most of an hour. Caracas as all of Venezuela will experience this seemingly continuous quake, which will approach a magnitude 8 in strength at times. As we have mentioned, the east coast of S America just goes along for the ride. There will be sympathetic jolts from the great quakes elsewhere on the plate, but these will be relatively minor, at most a magnitude 7. When the seaway at Buenos Aires rips open, this is a silent adjustment, as most stretch zone adjustments are. The residents will recover from any earthquakes to see the far shore of the seaway at a greater distance, and the mouth of the Rio Parana widened. The Zetas have described the tearing of the St. Lawrence Seaway as integral to the pending major adjustment along the New Madrid Fault line. The N American continent is held, unmovable, at the top. When the lower part of the N American continent pulls to the west, at Mexico, more than adjustments up and down the Mississippi occur. The Seaway will also adjust. How does this relate to a massive heaving and renting open of the ground in Menominee, MI recently? A Michigan family's property has a sudden unexplained divide. 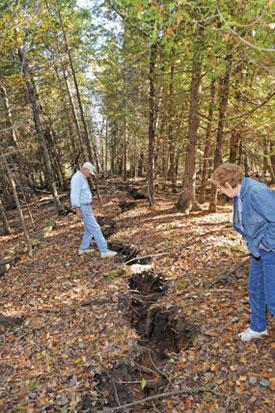 A large unexplained crack now runs 200 yards through the Salewsky family's property, eight miles north of Menominee in Birch Creek. The family thinks it happened yesterday around 9:00 in the morning. The ground raised five feet up, taking trees along for the ride. Some cracks were up two feet wide and five feet deep. There have been no recent reports of any earthquakes in the area. People specializing in geological surveying are being called in to try and explain the phenomenon. One day the land was flat and filled with trees shooting straight into the air. Twenty-four hours later there's a 600-foot-long crack, 4-feet deep twisting its way through the woods - and those vertical trees are now pointed 30 degrees left and right where the earth has mounded 15 feet high. The New Madrid Fault line in fact runs up along the Seaway. ZetaTalk Comment 9/25/2010: It is known by man that the New Madrid Fault line runs beyond the immediate area of New Madrid. Rock detached from its former connections is free to react to the dominant theme in the area. If rock was held down, formerly, it can bounce up. If rock was held back, it is free to spring forward. And adjustment in rock strata means that loose soil will sink or heave. This most certainly can affect a broader area than just the fault line. Per the Zetas, the effect of the tearing Seaway affects all the lands from the mouth of the St Lawrence Seaway to the Black Hills of South Dakota. On August 2, 2007 the bridge over the Mississippi River at Minneapolis, MN snapped, flinging the south end of the bridge 50 feet to the east as it did so, as detailed in Issue 35 of this newsletter. Clearly, this bridge was being twisted! Then on November 29, 2007 a pipeline near Duluth, MN at Clearbrook ruptured, as detailed in Issue 52 of this newsletter. Then a Green Bay hum emerged on July 28, 2008, as detailed in Issue 89 of this newletter, caused by rock under stress as the seaway pulls apart. Then on August 7, 2008 in Kincardine, Ontario, just across Lake Huron from Michigan, tremendous booms occurred from snapping rock, as detailed in Issue 91 of this newsletter. 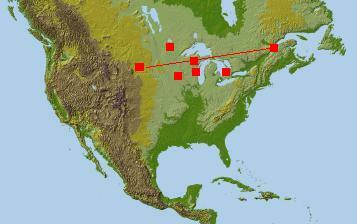 All these incidences are along a line drawn from the mouth of the Seaway to the Black Hills of South Dakota. You received this Newsletter because you Subscribed to the ZetaTalk Newsletter service. If undesired, you can quickly Unsubscribe. You can always access prior Newsletters from the Archives.